Listed are events happening in The Mountain area and surrounding communities. Public Meetings, Events & Things to Do, Support Groups, Clubs/Groups/Classes/Clinics, Senior Center Events, Recreation Providers, Visitor Information, Volunteer Opportunities, Bulletin Board, Music Line Up and The Dining Guide. Submit calendar items to peggy@mountaintimesoregon.com by the 21st of the month. Graduation Ceremony at Guide Dogs for the Blind, 1:30pm, Oregon Campus, 32901 SE Kelso Rd, Boring. Ceremonies commemorate the efforts of students and their dogs. Groups welcome with reservation. Guests should bring tissues, this is a moving event and one of the best ways to get acquainted with the program. Info: 503-668-2100. Mt. Hood Cultural Center and Museum's Social History Happy Hour (last Sat each month). 7pm. 88900 Government Camp Loop, Govt. Camp. Info: 503-272-3301. Mt. Hood Cultural Center & Museum, 88900 E Hwy 26 Business Loop, Government Camp. Hours: 9am-5pm every day except Christmas & New Year. No admission, but donations accepted. Exhibits interpret history of winter sports, early exploration, settlement and natural history of Mt. Hood. Internet access/WiFi available. Info: 503-272-3301, www.mthoodmuseum.org. Art at the Hoodland Public Library, 24525 E Welches Rd., Welches. Visit the library to see the beautiful quilts made by the local group, The Piecemakers! A different quilt on exhibit each month. The Clackamas County Arts Alliance also exhibits the works of local (county) artists. Exhibit changes quarterly. OMSI, 1945 SE Water Street, Portland. "The Science Behind Pixar." (through June, 2019). Experience the science, technology, engineering, art and math concepts used by artists and computer scientists, and learn about the filmmaking process through hands on activities. Info: www.omsi.edu. Open Mic hosted by Dillon Coran, 9pm, at The Skyway Bar & Grill, 71545 E Hwy 26, ZigZag. Timberline Lodge tours Friday, Saturday and Sunday. 11am, 1pm & 2pm. Join a US Forest Service Ranger for a 25-minute tour of historic Timberline Lodge. Explore the rich history of the lodge and all it has to offer. Tours are free and available to everyone. Donations not required but appreciated to ensure programs can be continued. Meet at US Forest Service desk inside Timberline Lodge. Info: 503-622-2033, www.timberlinelodge.com. Sandy Actors Theatre presents "Fuddy Meers," by David Lindsey-Abaire, directed by Erin Bass. (Runs through April 14). Not suitable for children under 12 - this show contains adult content and language. Located behind Ace Hardware at 17433 Meinig Ave., Sandy. Show times: Friday/Saturday at 7:30 pm, Sunday matinees at 3 pm. Tickets: $18 adults/$15 Seniors, Veterans, Students (w/ID), $13 children 12 and under. Active duty military in uniform, free. Info: 503-668-6834, sandyactorstheatre.org. Readers Theatre in Gresham presented by Mt Hood Repertory, 7pm, Gresham Chapel & Evening Event Center, 257 SE Roberts Ave., Gresham. Presenting "On the Verge," by Eric Overmeyer, directed by Kathleen Worley. Three intrepid female explorers venture through Terra Incognita, traveling through both space and time meeting strange creatures. An imaginative feast of adventure and playful language. Admission: Adults $9, Students $4. Info: www.mthoodrep.com. Mt Hood Community College Planetarium Show, 6pm & 7:15pm, MHCC Planetarium Sky Theater, 26000 SE Stark Street, Gresham. "Auroras, Cosmic Rays, Shooting Stars and other Space Invaders." All shows presented under a realistic representation of the night sky, featuring the latest galactic, stellar and planetary images. Cost: $5 & $2 for MHCC students and children 17 and under. The Sky Theater is wheelchair accessible. Info: 503-491-8297. Sunset Snowshoe Tour at Timberline, 7pm. A complimentary guided snowshoe stroll around Timberline Lodge with a guide. Meet in the Lower Lobby of Timberline Lodge 1/2 hour prior to start time. The complimentary snowshoe tour is 3/4 mile. Dress warmly and please bring snowshoes or rent from Timberline (rental shop hours 9am-4pm daily). Info: timberlinelodge.com. Bingo, Sandy Grange Hall, 34705 SW Kelso Rd., Sandy (first & third Fridays). Doors open 5:30pm. Hot meal served at 6pm. Cost $5 per person. Bingo at 7pm, 3 cards for 12 games, $12. Info: 503-637-6608. Library Coffee House, 6pm, 38980 Proctor Blvd., Sandy (first Fri each month), featuring Fergheart. Fergheart represents the musician's version of the American Dream. Always a fun, family event. Music, coffee and dessert. Info: 503-668-5537. Mt Hood Community College Planetarium Show, 6pm & 7:15pm, MHCC Planetarium Sky Theater, 26000 SE Stark Street, Gresham. " Auroras, Cosmic Rays, Shooting Stars and other Space Invaders." All shows presented under a realistic representation of the night sky, featuring the latest galactic, stellar and planetary images. Cost: $5 & $2 for MHCC students and children 17 and under. The Sky Theater is wheelchair accessible. Info: 503-491-8297. WPTCO Family Carnival and Silent Auction, 4-8pm, Welches Middle School, Welches. Lots of activities, fun and games for the whole family, with carnival inspired food. "Food for Fines" during National Library Week at the Hoodland and Sandy Public Libraries. $1 off your fines for each non-perishable food item you bring in. Damaged or expired items, and Ramen noodles not accepted. This applies to overdue fines only, not fines for lost or damaged items. Poetry Slam Competition, 7pm, Sandy Library, 38930 Proctor Blvd., Sandy. Portland poet Scott Poole will host this supportive and casual event. Three age categories with a $25 prize for the winner in each group and a $100 grand prize for the overall winner. All poems must be original. Register online at http://www.ci.sandy.or.us/library. Deadline is April 9 to have your name included in program. Walk-in registration also allowed. Info: Katie Murphy, kmurphy@ci.sandy.or.us. Author Talk and book signing, 4pm, Sandy Library, 38980 Proctor Blvd., Sandy. Jane Kirkpatrick, author of "This Road We Traveled," and Stafford Hazelett, author of "Wagons to the Willamette," will give a co-author presentation and interactive Q&A session with the audience. Both authors will have books for sale and signing. Followed by an Artist Reception, 6-8pm, at AntFarm, where 25 paintings and artworks by local artists who have been inspired by "This Road We Traveled" will be displayed. Info: Maureen Houck, mhouck@ci.sandy.or.us. Clackamas Repertory Theatre presents "Wing It for Kids." 10:30am, Osterman Theatre in the Niemeyer Ctr, at CCC campus, 19600 Molalla Ave, Oregon City. Fun shows for children ages 2-10 years old. Tickets $5 at door, cash or check only. www.clackamasrep.org. Clackamas Repertory Theatre's Annual Gala, 6:30pm, Osterman Theatre in the Niemeyer Ctr, at CCC campus, 19600 Molalla Ave, Oregon City. Help support Clackamas Rep's 2019 season by attending the annual gala and indulge in complimentary wine with sweet and savory edibles. Silent auction and entertainment. Tickets: $75 per person or $130 for two, available at clackamasrep.org, 503-594-6047. Full Moon Snowshoe at Timberline, 8pm. A complimentary guided full moon snowshoe stroll to explore the open fields and forests around Timberline Lodge with a guide. Meet in the Lower Lobby of Timberline Lodge 1/2 hour prior to start time. The complimentary snowshoe tour is 3/4 mile. Dress warmly and please bring snowshoes or rent from Timberline (rental shop hours 9am-4pm daily). Info: timberlinelodge.com. Historic Cherryville Cemetery clean up with SOLVE, 9:30am-12noon. Help to clean up trash, downed limbs and debris, and cleaning around the pioneers' headstones. From Sandy, drive 6.6 miles east on Hwy 26, turn left on Baty Rd and drive .2 miles to the stop sign, turn right onto Cherryville Rd and drive .5 miles. A SOLVE event sign will be at the end of a driveway. Sorry, no bathroom facilities and not suitable for very small children. Easter Egg Hunt, 12 noon, at Mt Hood Oregon Resort, 68010 E. Fairway Ave., Welches. Held at The Courses. Info: www.mthood-resort.com. Celebrate National Poetry Month with a Poetry Open Mike, 6:30-7:30pm, Hoodland Public Library, 24525 E Welches Rd., Welches. Everyone ages 12 and up is welcome to recite your original or favorite poetry or just listen and support others. Poems must be appropriate for an all-ages audience, and each recitation is limited to 3 minutes. Time permitting, readers may recite more than one poem. Info: Lara, lwilent@ci.sandy.or.us. For more info on poetry and National Poetry Month, visit www.poets.org. Solv It in Sandy, a community clean up to celebrate Earth Day, 9am-1pm. Make a difference by pitching in to clean local parks and public spaces. Sign up for 1/2 hr to 4-hr jobs. Check in at the Sandy Community Center, 38348 Pioneer Blvd,. or call 503-668-5569, ccohen@cityofsandy.com. Repair Fair, 10am-1pm, Sandy Community Center, 38348 Pioneer Blvd., Sandy. Volunteers are available to fix items, and perhaps to teach you how to fix your own. Bring broken items (nothing large or heavy) and any replacement parts you think you might need. Clean clothing for simple repairs to garments and textiles, such as sewing on a button, or mending. No alterations please. Please remember the volunteers may not be able to fix everything, and there is no guarantee you will walk out with a workable item, but the volunteers will give it their best shot. Info: Susie Jenkins, sjenkins@ci.sandy.or.us. Children's Day, Book Day/Dia de los Niños, Dia de los Libros, 2-4pm, Sandy Library, 38980 Proctor Blvd., Sandy. A bilingual celebration! Crafts, games, music, face painting, cake, live music and much more. Free. Info: Katie Murphy, kmurphy@ci.sandy.or.us. Twenty-Four Hours in Sandy, all day. 24 photographs, one for each hour of a day in Sandy, to showcase the different perspectives of the town. A community project designed to capture the essence of Sandy. Each participant may sign up for an hour and during that time slot, will take photos somewhere within 5 miles of the Sandy Library. Three photos from each entrant can be submitted, and one will be in the display. Please register to participate before April 8. Questions? Contact Thea Ellen at tellen@ci.sandy.or.us. Breakfast at the Sandy Grange, 8-11am (last Sun of every month). 34705 SW Kelso Rd., Sandy. Ham, pancakes, eggs cooked to order, juice and coffee. Cost $4. Info: 503-637-6608. Free food market, 9-10am (last Mon each month) at the parking lot behind Hoodland Senior Ctr., 65000 Hwy 26, Welches. Open to any person in need. Bring your own bags. No ID, name or address needed. Info: hoodlandlutheranchurch@gmail.com. Sandy Toastmasters weekly meetings, (Lower Rec Room), 6:15-7:30pm, 39495 Cascadia Village Dr., Sandy. Sandy Toastmasters provides a mutually supportive and positive learning environment to develop communication and leadership skills. All that and fun at the same time! Info: Steven Winkler, 503-668-3607, stevesandy9@gmail.com. Sandy Area Chamber of Commerce’s Good Morning Sandy, various locations, 7:30am. Info: 503-668-4006, www.sandyoregonchamber.org. Sandy City Council Meeting, 7pm, (first & third Mon each month), Council Chambers, 39250 Pioneer Blvd., Sandy. Info: 503-668-5533. Boring CPO Meeting, 7pm (first Tues each month), Boring Fire Station, 28655 SE Hwy 212, Boring. Mount Hood Area Chamber of Commerce monthly meeting, 8am, (first Tues each month), at the Mt Hood RV Resort, 65000 Hwy 26, Welches. Info: www.mthoodchamber.com. Library Advisory Board Meeting, 6:30pm, Hoodland Library, 24525 E Welches Rd., Welches. Info: Sarah McIntyre, smcintyre@ci.sandy.or.us. Hoodland Fire District Board of Directors, 7pm, (second Tues each month), Hoodland Fire District, 69634 E Hwy 26, Welches. Info: 503-622-3256, www.hoodlandfire.com. Mt. Hood Lions Club monthly business meeting, 6:30pm (second Wed each month), at their building on the corner of E Hwy 26 and E Woodsey Way, Welches. Info: 503-622-4223. Disability Services Advisory Council of Clackamas County (third Tues each month) 1:30-3:30pm, 221 Molalla Ave., Ste 104, Oregon City. Meetings are held in an accessible space. Issues of the physically disabled community, their families and caregivers. DSAC reviews Medicaid, state and local issues that may have an impact on transportation, benefits, housing and other programs for the disabled. Clackamas Co. residents invited to attend. www.dsac-cc.org. Committee for Citizen Involvement (CCI) of Clackamas County, 7-9pm, (third Tues each month) Public Services Building, 2051 Kaen Rd., Oregon City. A process-oriented committee, providing resources and opportunities for citizens to participate effectively in Clackamas County's land use planning and decision making process. Info: 503-655-8552. AL FORNO FERRUZZA, 72385 Hwy 26, Rhododendron. 503-622-1212. Wood fired pizza, Sicilian pasta. Dine in, carry out, delivery. Full Bar. Open 7 days/week. BRIGHTWOOD TAVERN, Brightwood Bridge Rd. 503-622-1568. Burgers, chicken, soups. Lunch specials Mon - Fri. Full menu every night. Happy Hour daily 3:30-6:30 pm. Pool Tourneys. COFFEE BREWSTERS, Hoodland Shopping Ctr., 503-622-3396. Espresso, Scones, Bagels, Sandwiches, Snacks. Free Wi-Fi. Monthly Coffee Special. EL BURRO LOCO, 67149 Hwy 26, Welches. 503-622-6780. Lunch, Dinner, Mexican favorites, Take out available. Margaritas. Cantina. Patio. IVY BEAR FAMILY PIZZERIA, 54735 E Hwy 26, Sandy. 503-208-9111. Fresh made pizza, calzones, wings, salads, homemade dressings, ice cream floats. Wine/Beer/Soda. MT HOOD BREWING CO, 87304 E Gov’t. Camp Loop, Gov’t Camp. 503-272-3172. Entrees, sand-wiches, pizzas. Handcrafted beers. Happy Hour daily 4-6 pm. Family friendly. Dog friendly deck. MT. HOOD OREGON RESORT, Welches. 503-622-2214. Altitude: B’fast/Lunch/Dinner. Happy Hour & specials. mallards café & pub B’fast at 7am. Lunch/Dinner menu 11am. SKYWAY BAR & GRILL, 71545 Hwy 26, Zigzag. 503-622-3775. Dining, all ages til 10pm. Firepit. Handmade foods, famous mac’n cheese. Live Music (see lineup). THE RENDEZVOUS, 67149 Hwy 26. Welches, 503-622-6837. Lunch & Dinner, fresh local seafood. Grill & Tap Room. Patio. Chef’s Daily Specials. Wine Down Wed. Take & Bake specials. THE SHACK, 67350 Hwy 26. Welches. 503-622-3876. B’fast, Lunch & Dinner. Sports Bar-Big Screen TVs. Taco Tues. Military & Vet Discounts. Free Pool Sun & Mon. Patio. TIMBERLINE LODGE, Timberline. 503-272-3267. Cascade Dining Room - Fine Dining; Ram’s Head Bar - Casual Dining w/stunning views; Blue Ox Bar - Casual Dining. WHISTLE STOP, Hwy 26, Brightwood. 503-622-3440. Homemade soups & breads. Breakfast until 2pm, Moon’s famous Whistle Burger, Lunch & Dinner. Fri/Sat Karaoke at 9pm. MT HOOD ROASTERS, 73451 Hwy 26, Rhododendon (By DQ) 503-622-6574. Espresso, summer drink specials, outdoor seating, freshly roasted coffee beans by the pound. 7 days a week, 8-5. HOODLAND SENIOR CTR-65000 E. Hwy 26, Welches. Info: 503-622.3331. There are many additional outings with the Hoodland Senior Center during April, including regular shopping trips, Indian Head Casino, Shopping at Wood Village, Oregon Gardens and local lunches out. Please check with the Senior Center for a full list of activities and to register for special trips. Bus Drivers needed for shopping and day trips. Valid Class C Driver's License and completion of two classes and a written test (at no cost to you) is required. Can you help? Blood Pressure checks, 8am-5pm, at Hoodland Fire Dept. No appointment necessary. Better Bones for Balance, 10-11am. Beginning class will improve fitness, strength and balance. Dress in comfy clothing, sneakers/running shoes. Knitting with Valerie, 1pm. Plenty of knitting needles and yarn available or bring your own. Pinochle and cards, 1:30pm. Everyone is welcome to come and play. Board Meeting, 10am at the Center. Everyone welcome to share ideas. Caregiver Support Group, 2:30pm (second Tues each month). Info: Donna, 503-622-3226. Free Food Market, 9-10am. Food is free and anybody is welcome. Please bring bags or boxes. SANDY SENIOR CTR-38348 Pioneer Blvd., Sandy. Info: 503-668-5569. There are many additional outings with the Sandy Senior Center during April, including shopping trips, Multnomah Falls, the Jefferson Dancers, Mission Mills & Willamette Heritage Ctr., Great American Tiny House Show, hikes, lunches out and more. Please check with the Senior Center for a full list of activities at ci.sandy.or.us and to register for special trips. The Sandy Senior Center needs Volunteer Drivers. If you are able to help, please contact the Senior Center for information. Silvertones Music Group, 10am. New members welcome at all times. Oil Painting, 1pm. Info: Anna Mae Lindsay, 503-668-4476. Bridge, 6:30pm. Veteran players and newcomers welcome. Pool Table, 9-11am. Join a small group for a game of pool. Show up when you can. Functional Fitness. 11am. Increase flexibility and strength. Chair support if needed. A Change of Pace, 12:30-4:30pm. Appropriately structured activities for individuals with Alzheimer's Disease or related dementia disorders. Cost: $14 for 4 hours. Cribbage lessons & games, 1-3pm. All welcome. Functional Fitness, 11am. Increase flexibility and strength. Chair support if needed. Alcohol Awareness with speaker Melissa Thompson, 10:30-11:30am. Increase awareness and understanding of alcohol addiction. Birthday Party, 11:45am-1pm, Come for lunch, have some birthday cake and enjoy music by The Silvertones. Law Project, 9am-12pm. By appointment only. Legal help offered, 30-min appt. Potluck, 12 noon. Bring your own table service and a favorite main dish, salad or dessert to share. Coffee provided. The Grief Support Group (sponsored by Mt Hood Hospice) meets 2-3:30pm each Monday, Trinity Lutheran Church, 507 W Powell Blvd., Gresham. No charge, but registration is required. For more information call Cindy Johnson, 503-668-5545. Estacada Friendship Group-Alcoholics Anonymous, 7pm, St. Aloysius Community Hall, 297 N. Broadway Street, Estacada. Sandy Discovery Group-Alcoholics Anonymous, 7pm, Foursquare Church of Sandy, 39300 Dubarko Drive, Sandy. Sandy Courage to Change Alcoholics Anonymous (Ongoing recovery meeting), 2pm. Sandy Actors Theatre, 17333 Meinig, Sandy. Sandy Principles and Progress - Al Anon Family Group, 6-7pm, 38348 Pioneer Blvd., Sandy. Sandy Discovery Group-Alcoholics Anonymous (Sandy Women's meeting-closed meeting), 7-8:15pm, Immanuel Church, Fellowship Hall, 39901 Pleasant Street, Sandy. Sandy Tuesday Night-Alcoholics Anonymous, 7:30-9pm, Sandy Community Ctr, 38348 Pioneer Blvd., Sandy. Clackamas Women's Services offers a free domestic violence support group, 11:30am-1pm, (each Wed). A Safe Place, Family Justice Ctr. for Clackamas Co., 256 Warner Milne Rd, Oregon City. If you would like support from healing in an abusive relationship, join in this confidential group. Bring your lunch or snack if you wish. Info: CWS Crisis and Support Line, 503-654-2288; A Safe Place, 503-655-8600. Courage to Change Group-Alcoholics Anonymous, 12-1pm, Lutheran Church, 39901 Pleasant St., (lower level), Sandy. Courage to Change Group-Alcoholics Anonymous, 5:30-6:30pm, Immanuel Church, Upstairs, 39901 Pleasant St., Sandy. Al-Anon, 6-7pm, St John in the Woods Catholic Church, 24905 Woodsey Way, Welches. Welches Timberline Group-Alcoholics Anonymous, 7:30-9pm, St. John in the Woods Church, 24905 Woodsey Way, Welches. Welches Timberline Group-Alcoholics Anonymous, 6:30-7:30pm, St. John in the Woods Church, 24905 Woodsey Way, Welches. Sandy Discovery Group-Alcoholics Anonymous, 7-8pm, Foursquare Church of Sandy, 39300 Dubarko Drive, Sandy. Welches Timberline Group-Alcoholics Anonymous, Woodsey Way Women's AA - closed meeting. 6-7pm, St. John in the Woods Church, 24905 Woodsey Way, Welches. Sandy Discovery Group-Alcoholics Anonymous, 7-8:15pm, Foursquare Church of Sandy, 39300 Dubarko Drive, Sandy. Welches Timberline Group-Alcoholics Anonymous, 5-6pm, St. John in the Woods Church, 24905 Woodsey Way, Welches. Sandy Discovery Group-Alcoholics Anonymous, 9-10:15am, Living Way Fellowship Foursquare Church, 39300 Dubarko Road, Sandy. Grace in Govy-Alcoholics Anonymous, 5:30-7:30pm every Sunday at Mt Hood Cultural Center & Museum, Government Camp. Veteran's assistance, 9:30am-noon, Sandy VFW Hall, 38452 Proctor Blvd., Sandy (third Thurs of month). Janice Tafoya, Veterans Service Officer for Clackamas County, will assist veterans on a first-come, first-served basis. Or schedule an appointment at Clackamas County Veterans Service Office, 1810 Red Soils Court, Oregon City at 503-605-5631. NAMI Family Support Group, 9-10:30am, (third Sat each month) Immanuel Lutheran Church, 39901 Pleasant Street, Sandy (behind police station). Please enter by the back door. This is a family support group for loved ones of persons with a mental illness. Info: Blythe Nordbye, 503-680-2849, blythenordbye@gmail.com. Alzheimer’s Support Group, 1-2:30pm, (fourth Wed each month), Trinity Lutheran Church, 507 W. Powell Blvd., Gresham. Info: Jeanette Vice, 503-666-4305. Sandy School Based Health Center, Mon-Fri 7am-3pm for Oregon Trail School District Students, grades K-12 at Sandy High School (east entrance) while school is in session. Provides a range of medical services, including injury and illness diagnosis and treatment, physicals, screenings, lab tests, immunizations and more. Students and families are not billed for services - insurance is billed when available. Info/Appt: 503-668-3483. Also open to everyone from 3pm-8pm Mon-Fri. Call 503-655-8471 to schedule appt. www.clackamas.us/healthcenters. Ukulele Classes, 2:15-3:45pm, Hoodland Senior Center, 65000 Hwy 26, Welches. All levels welcome. Donations gladly accepted but not required. Preschool Story Time and Me and My Playgroup, 10-11am, Sandy Public Library, 38980 Proctor Blvd., Sandy. Book a Librarian, 2-6pm, Hoodland Public Library, 24525 E Welches Rd., Welches. Make an appointment or drop in for assistance from a reference librarian with research, using library resources. Info: hoodlandlibrary@ci.sandy.or.us or 503-622-3460. Community Acupuncture with Stacey McCarthy, L. Ac of Mountain Acupuncture, 5-7pm. Relaxation and pain relief in a friendly group setting. Cost: $30. Call 503-754-9053 to sign up. Silent meditation and discussion with Wy'East Zen Center, meeting at Celtic Spirit Yoga, 38736 Pioneer Blvd., Sandy. 6:30-8pm. Doors open at 5:45pm. The forms are Soto Zen but all faith traditions are welcome. Beginner instruction is available. Info: Emile Cartoun, 503-997-3193, emilie@wyeastzencenter.org. Wee Ones Story Time, 10-11am, Sandy Library, 38980 Proctor Blvd., Sandy. Appropriate for children 6 months to 3 years old. Info: Monica, msmith@ci.sandy.or.us. Weekly Story Time, 2-2:30pm, Hoodland Public Library, 24525 E Welches Rd., Welches. Appropriate for children through preschool age. Info: Monica, msmith@ci.sandy.or.us. Writers' Workshop, 2-4pm, Hoodland Lutheran Church, 59151 Hwy 26, Brightwood. Donations gladly accepted but not required. Youth Art Class, 4-5:30pm, Sandy Public Library, 38980 Proctor Blvd., Sandy. In partnership with Wy'east Artisans Guild. For 1st-6th graders. Preschooler activities available with a parent present. Info: Monica, msmith@ci.sandy.or.us. "Read to the Dog," (Every other Thurs), 6-7pm, Sandy Public Library, 38980 Proctor Blvd., Sandy. Kids learning to read can practice their skills. Reading to a dog will help struggling kids gain confidence in a no-stress, non-judgmental environment. Call 503-668-5537 to make a 15-min appointment for your child. Info: Monica Smith, msmith@ci.sandy.or.us. Saturday Afternoon Kids' Club, 1-2pm, Hoodland Public Library, 24525 E. Welches Rd. (1st Sat Art Club, 2nd Sat Lego Club, 4th Sat Lego Club), ages 6-12. Legos and art supplied provided. Info: Dianne, ddowney@ci.sandy.or.us. Saturday Afternoon Kids' Club, 2-4pm, Sandy Public Library, 38980 Proctor Blvd., Sandy. (1st Sat LEGO Club; 2nd Sat Pokemon; 3rd Sat LEGO Club; 4th Sat Science), ages 6-12. Info: Monica, msmith@ci.sandy.or.us. Hoodland Women's Club Meeting and lunch. 11:30am, at The Dragonfly Cafe & Bakery, 65000 Hwy 26, Welches (located at the Mt Hood Village RV Resort). All women ages 18 up are welcome to attend. Info: hoodlandwomensclub.org, or Cindy Fetty, fettycindya@gmail.com. Men's Book Club, 7-9pm, Sandy Library, 38980 Proctor Blvd., Sandy. Discussing "Pride and Prejudice," by Jane Austen. Info: Susie, sjenkins@ci.sandy.or.us. Mouse and Keyboard Basics, 10am, Sandy Library, 38980 Proctor Blvd., Sandy. Are you a new computer user with little or no experience using a keyboard or mouse? If so, come to this class and learn left click, right click and basic command keys. Register by calling 503-668-5537. Prime Timers Dining Club for singles age 50 and up. Meeting at M&M Restaurant and Lounge, 137 N Main Ave, Gresham, 503-665-2626. Come and start some new friendships! (typically first Wed each month). Social Time 6pm, dinner at 6:30pm. Dinner is Dutch treat. Info: www.PrimeTimersDiningClub, Pat, 503-936-5861. Keeping Your Home and Property Safe from Wildfire Workshop, 6-8pm, Hoodland Fire Station, 69634 Hwy 26, Welches. Learn about defensible space, fuel reduction, assistance available and more. No fee, but space is limited and pre-registration required. Clackamas Soil & Water Conservation Dist., 503-210-6000, tguttridge@conservationdistrict.org. Poetry Workshop & Reading, 6:30pm, Sandy Library, 38980 Proctor Blvd., Sandy. Award-winning poet, John Sibley Williams, offers a free poetry workshop followed by a poetry reading from his new books. Info: Katie Murphy, kmurphy@ci.sandy.or.us. Sandy Kiwanis, 6:30pm, (first & third Thurs) at Stephanie's Cafe, 39400 Pioneer Blvd., Sandy. Order off the menu. Info: www.sandykiwanis.org, 503-819-0511. Auditions for "Other People's Money," at the Sandy Actor's Theater, 10am, 17433 Meinig Ave, Sandy. Call-backs will be on Sunday, April 7 at 5pm. Rehearsals begin on Sunday, April 28. Info: 503-668-6834, it@sandyactorstheatre.org. Basket Making for Spring, 1:30pm, Sandy Library, 38980 Proctor Blvd., Sandy. Learn to weave a small, pretty basket. No experience needed, all materials provided. Take home a colorful basket and receive instructions to make more. Info: Susie Jenkins, sjenkins@ci.sandy.or.us. Clackamas County Master Gardeners, 7-8pm, Milwaukie Center, 5440 SE Kellog Creek Dr., Milwaukie. Speaker: Mark Leichty. "Fantastic Ground Covers and Where to Find Them." Program is free and open to public. Info: www.cmastergardeners.org. Computer Basics, 10am, Sandy Library, 38980 Proctor Blvd., Sandy. New to computers or has it been awhile since you used one? Learn how to start and shut down a computer; create, save and open a file; open a folder, and rename files and folders. Register by calling 503-668-5537. Mt Hood Republican Women club business meeting, 11:30am., Gresham Elmer's Restaurant, 1590 NE Burnside Road, Gresham. Speaker: Celestia Bue will talk about her recent trip to Vietnam and Cambodia. Both men and women welcome to attend. Info: President Clarice Moss, 503-658-5227, claricemoss@yahoo.com. Women's Book Club, 7-9pm, Sandy Public Library (second Thurs each month). 38980 Proctor Blvd., Sandy. Discussing "Factfulness," by Hans Rosling. Info: Susie Jenkins, sjenkins@ci.sandy.or.us. Sandy VFW Post 4273 Auxiliary Monthly Meeting, 6pm, (second Fri each month) at VFW Hall, 38452 Proctor Blvd., Sandy. Teen Paint Night, 7-8:30pm, Sandy Library, 38980 Proctor Blvd., Sandy. Local artist Melissa Lawrence will lead you, step by step, from bare canvas to a finished painting. Participants are required to register, space limited to 20. Info: Rebecca Robinowitz, rrobinowitz@ci.sandy.or.us. Internet Basics, 10am, Sandy Library, 38980 Proctor Blvd., Sandy. Are you an internet novice in need of more information? Learn basic internet technology and how to navigate a browser, locate a website, identify common domains, and stay safe while searching. Register by calling 503-668-5537. Cyanotype Teen Makerspace, 2:30-4:30pm, Sandy Library, 38980 Proctor Blvd., Sandy. Cyanotype is a photographic printing process that produces a cyan-blue print. Teens 12-17 welcome. Info: Rebecca Robinowitz, rrobinowitz@ci.sandy.or.us. Hoodland Book Group, 6:30-8:30pm, Hoodland Public Library, 24525 E Welches Rd., Welches. Discussing "The Enchanted," by Rene Denfeld. Info: Dianne Downey, ddowney@ci.sandy.or.us. Adult Egg Hunt, 9-10am, Sandy Library, 38980 Proctor Blvd., Sandy. Hunt for eggs in the library before it opens. Win gift cards, movie tickets, and more. Come for coffee, treats and fun. Hop on the trolley! Meet at the Sandy Community Ctr by 9am to ride the trolley from the Senior Ctr to the library and back. Info: Carol Cohen, 503-668-5569. Sandy Veterans of Foreign Wars Post 4273 Meeting, 6pm, (third Fri each month), VFW Hall, 38452 Proctor Blvd., Sandy. Popcorn & Plants, "Bees: Tales from the Hive," 6:30pm, Sandy Library, 38980 Proctor Blvd., Sandy. Bees have one of the most sophisticated social systems in the animal kingdom. Kris LaMar, OSU Master Gardener, will lead a discussion after participants view the documentary. Info: Susie Jenkins, sjenkins@ci.sandy.or.us. Flashlight Egg Hunt for Teens, 8:30-9:30pm, Meet at Meinig Park under the gazebo, Sandy. Bring a warm jacket, flashlight and a bag. Youth in grades 6-12 (middle and high school only). Find the golden eggs and win $$$. Info: Rebecca, rrobinowitz@ci.sandy.or.us. Clackamas County House District 52 Oregon Trail Democrats, 7pm, (fourth Tues each month), Clackamas Co. Bank Sunset Room, 38935 Proctor Blvd., Sandy. Everyone is welcome! Info: Susan Gates, 503-668-9628, www.oregontraildemocrats.org. 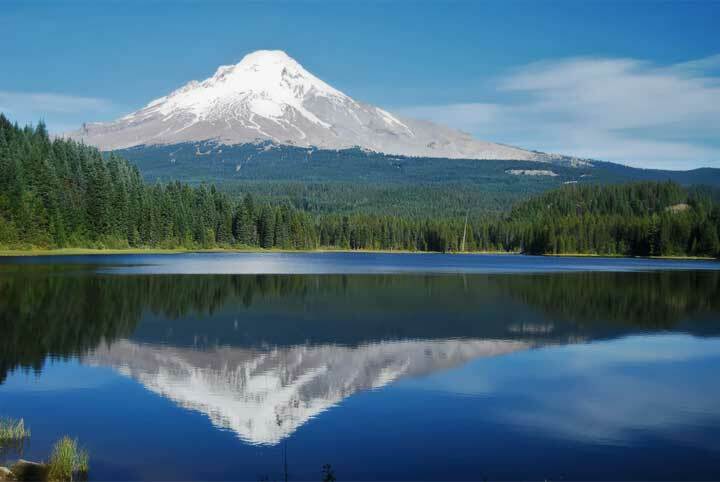 Mt Hood Lions Club (fourth Weds each month), 6:30pm, Social Time, 7 pm, Dinner meeting. At their building on the corner of E Hwy 26 and E Woodsey Way, Welches. Info: 503-622-4223. How to attract butterflies to your yard, 6:30pm, Sandy Library, 38980 Proctor Blvd., Sandy. This talk will cover what can be done for your yard and garden to attract all varieties of butterflies and keep them coming. Info: Susie Jenkins, sjenkins@ci.sandy.or.us. Mt Hood Lions Club Free Health Screening, Examen de salud gratis, 10am-3pm, Mt Hood Lions Club building, corner of Hwy 26/Woodsey Way, Welches. Eye tests, diabetes testing and glucose test (3 hr fasting required, and Diabetes Risk Test available (requires no fasting). Clackamas Women's Services looking for dedicated volunteers to help as support staff at Camp HOPE, Welches. Create memorable experiences for campers by being positive role models, celebrating campers' achievements, and assisting with preparations for daily activities. Camp HOPE is a week-long summer camp for children and youth who have experienced family violence. Classic Camp (ages 7-11), June 23-28. High Adventure Camp (ages 11-15), July 1-6. More information and to volunteer, e-mail josieg@cwsor.org, or call 503-557-5830. Love horses? Volunteer with Zeb's Wish Equine Sanctuary. For more info, call 503-341-1102, zebswish@gmail.com. The Hoodland Senior Center needs Bus Drivers for shopping and summer day trips. Valid Class C Driver's License and completion of two classes and a written test (at no cost to you) is required. Can you help? Info: 503-622.3331. C.E.R.T. (Community Emergency Response Team). Call the Hoodland Fire District for further information. Do you have what it takes? 503-622-3256, hoodland@hoodlandfire.org. Consider being a volunteer at the Mt. Hood Cultural Center & Museum, Government Camp. Hours and days very flexible. Call the museum at 503-272-3301 or drop by if interested. Guide Dogs for the Blind, Sandy, has various volunteer opportunities. Info: www.guidedogs.com, 503-668-2100. Timberline Lodge & Ski Area. Year-round skiing/snowboarding, lodge tours. 503-622-7979, www.timberlinelodge.com. Mt Hood Skibowl. Info: www.skibowl.com or 503-222-2695. The Fly Fishing Shop. Equipment, information, instruction. 503-622-4607, www.flyfishusa.com. Mount Hood Oregon Resort, Welches. Golf, Croquet, Spa, Dining. 503-622-3101, www.mthood-resort.com. Mt. Hood Adventures. Concierge-type services for recreational activities in the area. 88335 E. Government Camp Loop, Government Camp. 503-715-2175, 888-422-4776, www.mthoodadventure.com. Mt. Hood Village Resort. Fitness center/pool. 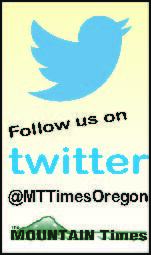 503-622-4011, www.mthoodvillage.com. Windells Camp, 59550 E Hwy 26, Sandy. Indoor skate facility and BMX. info@windells.com 503 622-3736. Mt. Hood Cultural Center & Museum, 88900 E Hwy 26 Business Loop, Government Camp. Open daily (except Christmas & New Year), 9am-5pm, 503-272-3301, www.mthoodmuseum.org. Brochures, maps, guide books, passes, etc. Mt. Hood Adventures, 88335 E. Government Camp Loop, Government Camp. Open daily, 9am-6pm 503-715-2175, 888-422-4776, www.mthoodadventure.com. Mt. Hood Info. www.mthood.info, 1-888-622-4822. Mt. Hood National Forest, Zig Zag Ranger District, 70220 E Hwy 26, Zig Zag. Open Daily, 7:45 am – 4:30 pm (closed for lunch noon – 1 pm). 503-622-3191, Ext. 668, www.fs.fed.us/r6/mthood. Sandy Historical Society Museum, 39345 Pioneer Blvd., Sandy. Open 7 days/wk. Mon-Sat 10-4 pm, Sun 12-4 pm Free Admission. 503-668-3378, sandyhistorical@sandynet.org, www.sandyhistorical.org. 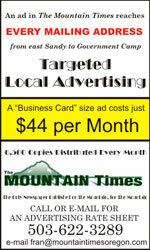 The Mt Hood Area Chamber of Commerce, 503-622-3017, mthoodareachamber@gmail.com, www.mthoodchamber.com. Sandy Area Chamber of Commerce, 38979 Pioneer Blvd., Sandy. Open Monday, Wednesday & Friday, 10 - 4 pm (Tuesday and Thursday available to members by appointment only) 503-668-4006. Clases de Inglés Gratis, Póngase en contacto con Katie, kmurphy@ci.sandy.or.us. Free English Classes offered at the Sandy Public Library. One to three participants will be paired with a native-English speaking tutor. Info/Registration: Katie, 503-783-2583, kmurphy@ci.sandy.or.us. If you're a veteran and need information regarding VA benefits, counseling, healthcare, home loans, etc. call 503-650-5631 or e-mail veterans@co.clackamas.or.us. The Sandy Community Action Center at 38982 Pioneer Blvd., Sandy, is the food pantry for residents from Boring to Government Camp. The Center provides emergency food assistance to those in need. The pantry is open for income-eligible people from 10am-4pm Wed & Fri and 10am-1pm Sat. Proof that you reside in the Oregon Trail School District is required. Food boxes through the community Basket Program are available on the third Thursday of the month from 9am to Noon. Info: www.sandyactioncenter.org, 503-668-4746. Hoodland Library's community room available for use by groups. Reservation requirements. Call for more information, 503-622-3460. Cultural Pass Program offers free or discounted adventures at local venues. Available at the Hoodland Library. Call for information as to available passes, 503-622-3460 or hoodlandlibrary@ci.sandy.or.us. For passes available at other Clackamas Co. libraries, visit www.lincc.org and click on Cultural Passes. Transit tokens at the Sandy and Hoodland Libraries. Daily unlimited ride passes for SAM and Mt Hood Express ($5); SAM/STAR 24 trip passes ($20); SAM/STAR monthly passes ($30); SAM/STAR 5 individual ride tokens ($5). Info: www.ci.sandy.or.us/fares.